Subaru Cherry Blossom Festival welcomes Madame Saito to Sakura Sunday! 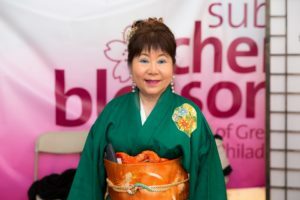 Philadelphia’s proclaimed Queen of Sushi, Madame Saito returns to Sakura Sunday to host the 6th annual Subaru Sushi Samurai of the Year contest! In addition to running the Le Champignon de Tokio restaurant in historic Society Hill, Madame Saito teaches sushi making classes for all skill levels. Madame Saito has been an ambassador of Japanese culture and fusion cuisine in the Philadelphia community for the past 25 years, with Temple University awarding her excellence with an Honorary Doctorate in Education in 2009, and the American Culinary Federation named her Philadelphia’s Chef of the Year in 2011. Watch Madame Saito crown the 2019 Subaru Sushi Samurai of the Year at 3:00 PM on the Main Stage! To learn more about Madame Saito & Le Champignon de Tokio, check out her website here. To sign up for sushi making classes, click here.